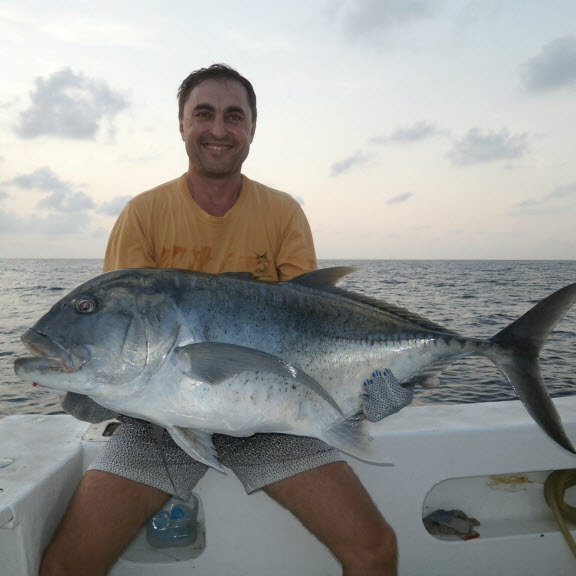 For the distinguished angler, we offer first class Big Game Fishing in Burma Banks in the Mergui Archipelago located in the southernmost part of the country of Myanmar (Burma). 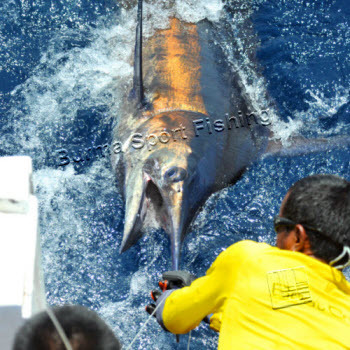 We focus our efforts on catching large Blue and Black Indo Marlin. We also do evening/night fishing weather permitting. Special requests accomodated. 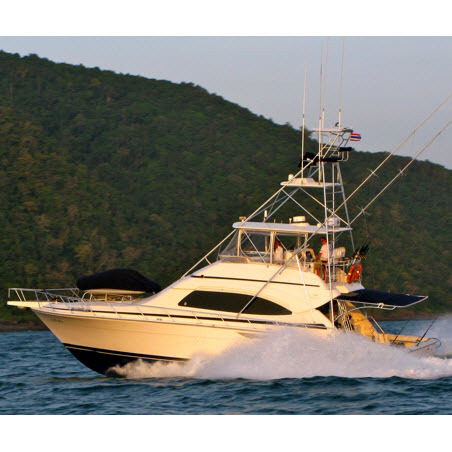 Reely Nauti Too, a 54 foot Bertram 510, is a sport fishing fighting machine for big game sports fishing including Marlin, Sailfish, Wahoo, Doggy Tuna, Yellow Fin Tuna, and Giant Trevally. Our boat is the best equipped sports fishing boat in SE Asia. We have over US$100K in tackle reels and rods from 130 lbs down to 25 lbs line. The boat is fully equipped for long range trips and has water maker, ice maker, deck freezer, deck fish box, indoor refrigerator and freezer, a quiet genset, full indoor air conditioning 24/7, fine wine/cuisine, every comfort, and English speaking crew :). Safety is our top priority. 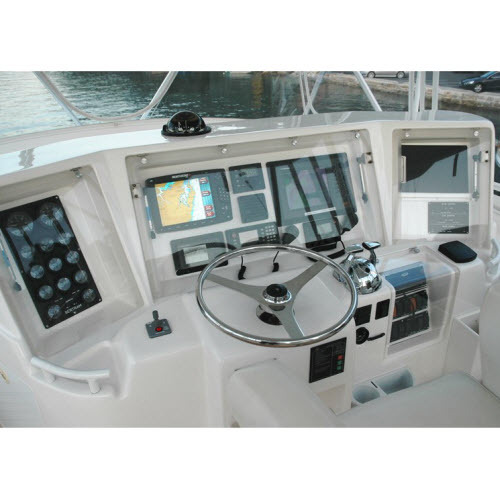 The boat has full Furno Navigation GPS, sonar and radar capability for all weather navigation. There is a redundant separate Lowarance system capable of all the same as a back-up system to insure that we can always get back to port. Additionally, the boat is equipped with a Thrane and Thrane all weather satellite phone (crew use only) for emergency and daily position reporting to ensure that we always have check in times and people know where we are. We are equipped with all other necessary safety equipment for a safe trip including Emergency Position Indicating Radio Beacon and life raft. The boat is available for Private Charters departing from Kawthong, Myanmar. The trip must be booked at least 6 weeks prior to travel for regulatory purposes. 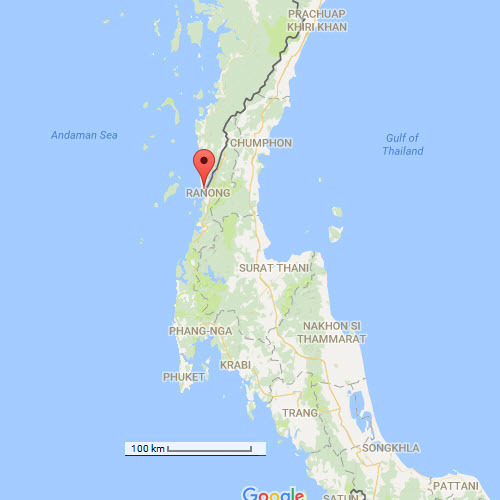 You must travel to Ranong Thailand and we can help you hire a Thailand Company to bring you to our boat in Kawthong (a 20 minute boat ride) as we offer no commercial services in the Kingdom of Thailand. Other excellent destinations in Indo waters can be discussed but we do not advertise the locations. Private Charter Myanmar 4 pax Max load. US$4,500.00 per day – 5 day min. Private Charter other Indo Location 4 Pax Max Load US$5,000.00 per day – 6 day min. The boat is available for Join Along Charter Trips with the boat owner departing from Kawthong, Myanmar. The trip must be booked at least 6 weeks prior to travel for regulatory purposes. You must travel to Ranong Thailand and we can help you hire a Thailand Company to bring you to our boat in Kawthong as we offer no commercial services in the Kingdom of Thailand. Other excellent destinations in Indo waters can be discussed, but we do not advertise the locations. We want you to have a fantastic and memorable time with us. Of course, all arrangements will be clarified and confirmed by phone/email before your departure for your peace of mind, so no worries. Please contact us for more info. You should be contacting us at least seven weeks prior to your planned trip to give us time to file for the required permit to fish in Burmese waters. Your correspondence will be handled by a native English speaker. Your trip will start with your international arrival in Bangkok, Thailand. We will meet you at your arrival in Bangkok and assist you. You will take a short (one hour) Thai domestic flight to Ranong. There are two flights daily, 05:45 and 17:05, and we will recommend the airline/flight once we know your arrival date/time. You will take a short (20 minute) boat ride to our boat in Kawthong, Burma. You will live on board our boat for the next five days. You only need to show up at Bangkok airport at the agreed time. We will make all the necessary arrangements for everything else. Immediate personal assistance upon your arrival at Bangkok International Airport. Round trip air transfer from Bangkok, Thailand to our boat in Kawthong, Myanmar. Unlimited meals, drinks, snacks, ice. Fine wines, liquors, beer and other alcohol by arrangement. All lures, bait, tackle, rods and reels. Basic snorkle equipment (mask and fins). One 10 minute call on satellite phone daily. Passenger insurance while on board. International air tickets to Bangkok and/or hotel. Light clothing and comfortable deck shoes. Everyone likes a friendly positive attitude and some enthusiasm! We don't collect personally indentifiable information except as necessary to provide you with the services you are requesting. We anonymously track website visitors, clicks, and page views for quality monitoring to enable us to provide you with a better user experience. CHANGE NOTICE: The contents of this page can and will change over time without notice. Placeholder for website Terms of Service (coming soon).